Since last Friday's post was a Halloween costume flashback, this week's High Five for Friday post covers two weeks of high fives. 1. Two weekends back a group of friends and I drove to The Woodlands for a birthday party at the Kendra Scott jewelry store. Having only visited The Woodlands (one of the country's first - and supposedly finest - master-planned communities) once before, I enjoyed the opportunity to dine at a new restaurant and see a little more of what this area has to offer. The best part, however, was celebrating with my friends and shopping for jewelry while sipping champagne and indulging in perfectly decorated Kendra Scott cookies. 2. That same weekend my in-laws drove in from Nebraska for a visit. We had a full day of activity - driving to Houston for Will's two soccer games - planned for Saturday, but when heavy rains rolled into town those plans went out the window. Will was understandably bummed as he desperately wanted to show off his skills to Grandma and Grandpa (and I was a little disappointed too as I LOVE to watch Will play soccer), but the unexpected opportunity to sleep in, pick up "good" coffee from Panera, go shopping with my mother-in-law and Hallie, and play in the rain made up for it. Leisurely Saturdays are few and far between these days, and we took full advantage of this one! 3. 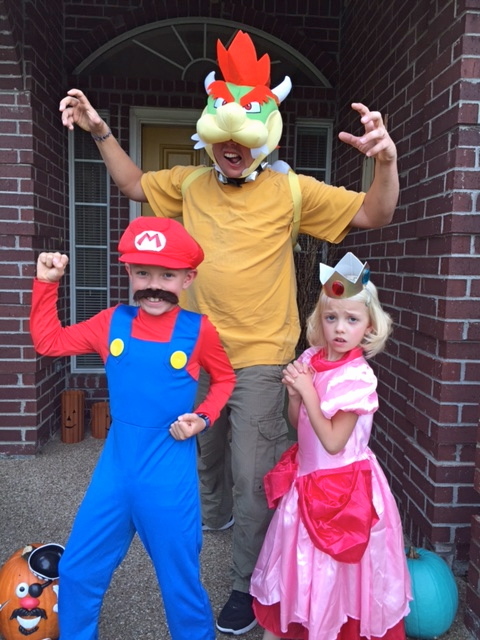 We survived Halloween! Despite my best efforts to keep Halloween low-key, the holiday ALWAYS ends up stressing me out at least a little. I love it all, but between costumes, candy, pumpkins, pumpkin patch, cupcakes, two school parties (at least one of which I've always been responsible for planning and implementing), and friend parties, I usually feel pretty burned out by the time I turn off the front porch light at 8:30pm on Halloween. 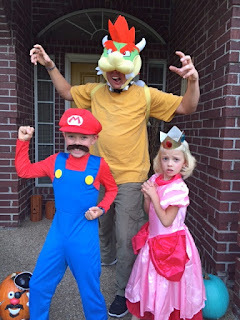 The lead-up to this year's Halloween was no exception, however each time a party or event - including trick-or-treating - rolled around, I found myself able to shut off the stress and enjoy myself. Look at me, I'm growing. Hallie and one of her teachers at her Halloween party. Hallie and me at her Halloween party. this year, down from seven dozen last year. It was a nice break! 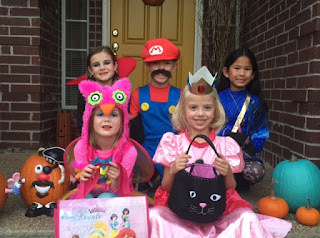 Mario and Luigi on Halloween Eve. talk began hours before trick-or-treaters started ringing doorbells. And finally Yoshi joined the bunch. 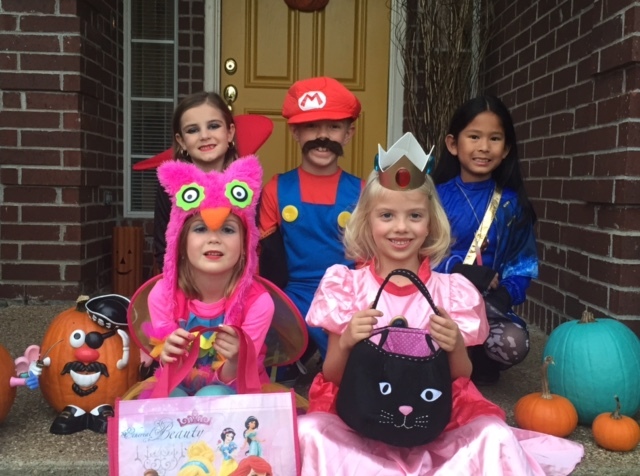 make sense to those of you who played "old school" Super Mario Bros.
And last but not least, all ready to go trick-or-treating with friends! 4. I headed out of town at the crack of dawn yesterday morning and won't return home until Sunday afternoon. To lend a hand in my absence (and because he wanted to visit, of course), my dad took a few days off and flew to College Station on Wednesday night. He's walking Will and Hallie to school; picking them up after school; taking them to karate, soccer, and (to a friend who will get Hallie ready for) Nutcracker rehearsal; helping with dinner and homework; and undoubtedly doing it all in a way Will and Hallie consider fantastically fun. Thanks, Grandpa Paul! we absolutely, positively could not have done it without him. 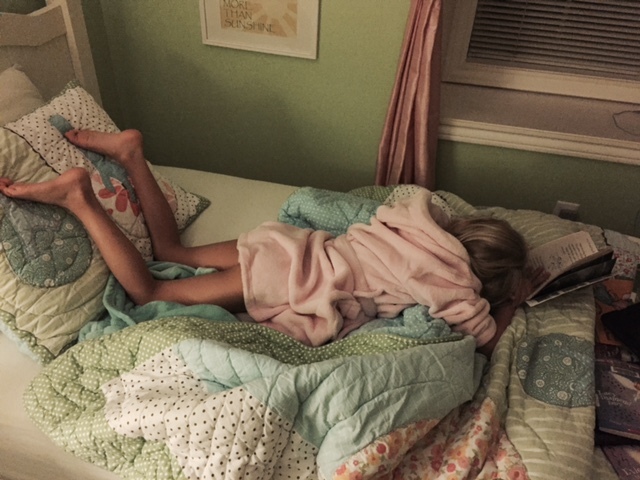 Lifesavers (his favorite) - waiting for him in the guest room. new pairs of dance shoes and two new pairs of sneakers last month. (and under the awning on that rainy day) for an Aggie soccer game last week. my all-time favorite cheese that we can't buy here. Sometimes he just sits like this. It's hilarious. fundraiser materials to school. Twice. People stared. The backdrop against which Hallie and I watched Will play soccer last week. And the view in the other direction. Not bad! time for a new and slightly longer Hawkeye dress.